Whether you cook a lot or not, you have a dream kitchen. You have a backsplash in mind, a color for the refrigerator picked out, and you even have a sketch of the perfect kitchen counter layout. The only thing missing: money. (And we should also include time because when there’s a toddler in the house, it's his needs that are pressing.) But it doesn't mean you have to give up on your dream completely. Start small by taking a look at your kitchen cabinets. Are you happy with the color? Do you like the material? Updating the look of your cabinets can greatly improve the overall ambiance of your kitchen. 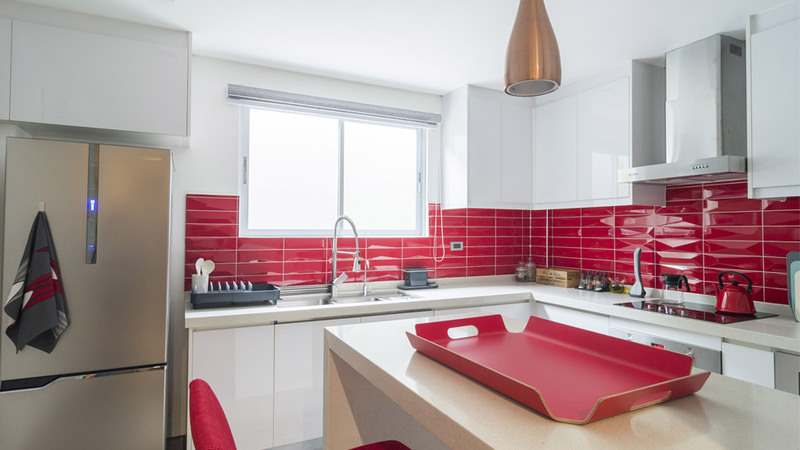 If one of your goals is to brighten up your kitchen, these low-cost ideas (at least compared to refurbishing the whole kitchen) will help. A fresh coat of paint can do wonders, especially if you haven’t made any improvements in the kitchen for years. 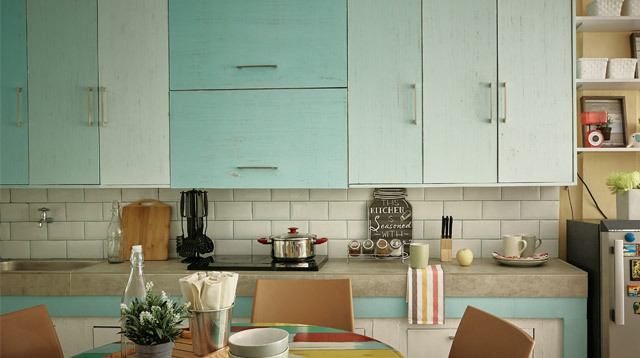 Cabinets with faded or peeling paint can instantly make the kitchen look drab so on your next free weekend, try testing your DIY skills with a can of paint and a paintbrush. If you aren’t that confident, you can tap your trusted handyman to do it for you as a few cabinets wouldn’t take hours to finish. Pick lively colors like yellow or orange – just make sure it matches the color scheme of your kitchen. Those who want to play it safe can stick to neutrals. If your last paint job still looks new, you can settle for accents to liven it up. Washi tapes with patterns and in vibrant colors can instantly give your kitchen a new look. 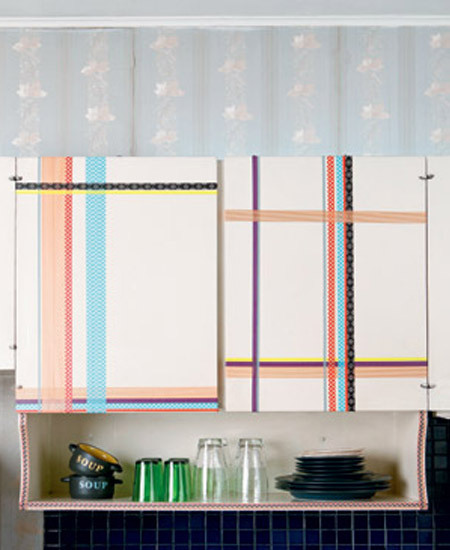 You can create patterns on the cabinets using your chosen tape or stick it like a border for a minimalist feel. Don’t be afraid to experiment. Let this DIY project inspire you! Are your cabinet knobs rusty? You can replace these with decorative knobs that are readily available in hardware stores. Depending on the look you have in mind, you can buy vintage-inspired ones or sleek knobs that can give your kitchen a modern upgrade. Are you always forgetting your grocery list? You can take note of the supplies you need to get on your cabinet doors. 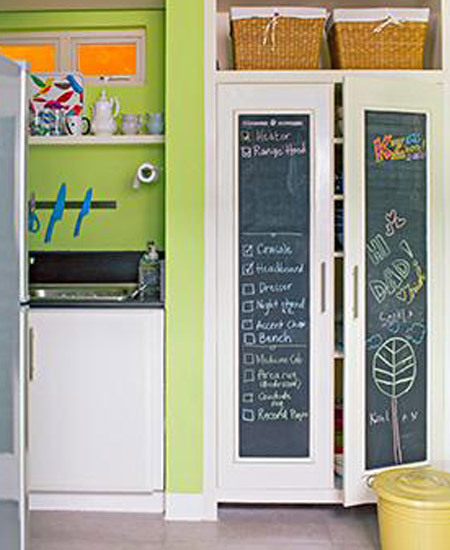 Instead of painting your cabinets with ordinary paint, choose chalkboard paint (available in hardware stores and home depots) to turn it into an instant blackboard. After this DIY project, you can write down your pantry supplies and your menu for the week, too! We’re all familiar with the struggle of getting the last can of soup at the back of the kitchen cabinet. The solution? Investing in a pull-out shelf that will make it easier for you to see the contents of each cabinet and get what you need. This requires the expertise of a handyman and a certain budget to cover materials and labor. This Old House has a list of materials, tools, and instructions you can use as reference. Click here. Once you’ve painted or decorated your kitchen cabinet, it’s not enough that you leave it at that. Make it extra functional by installing hooks or wire baskets inside the cabinet doors where you can hang kitchen utensils and pot lids. By freeing up precious space, you’ll be able to store more pantry supplies and kitchen essentials inside. 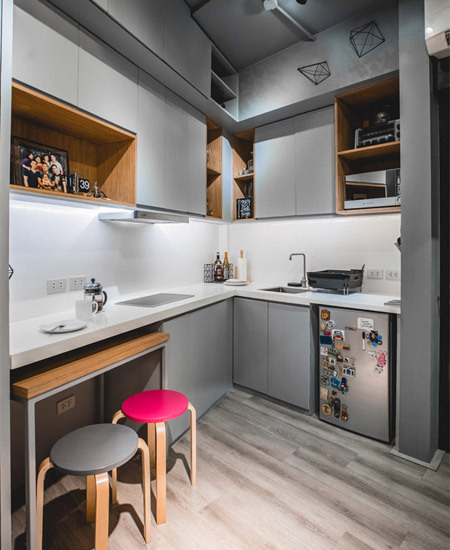 If you have overhead kitchen cabinets, you can consider installing task lighting underneath to make cooking more comfortable – especially at night. This requires professional help so you may want to consult with a trusted electrician. Yes, you read it correctly. If you have overhead cabinets and you aren’t up to maintaining them, you can get rid of the cabinet doors to create instant open shelves! Having open shelves will motivate you to keep it clean and organized at all times. Since you have an open shelf, you can display your favorite dinnerware or keep the things you use most of the time accessible. Just remember to declutter it regularly to prevent it from becoming an eyesore. 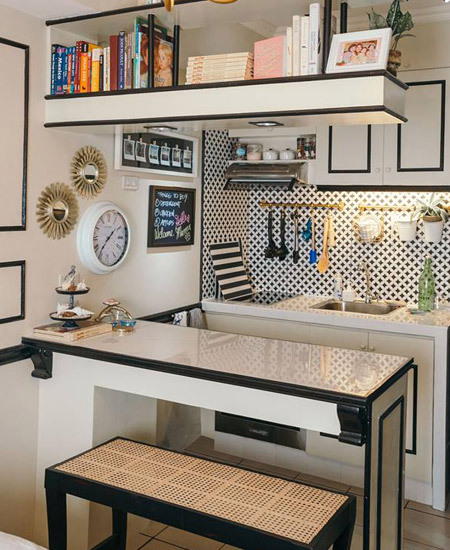 Whether it’s colorful paper with adhesive backing or wallpaper you’ve saved up for, you can use it to liven up the inside of your cabinet. If you’re doing tip #8, a pretty wallpaper will look good as shelf backing, too. 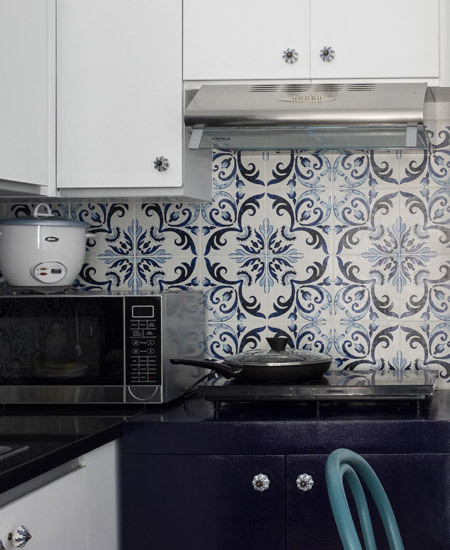 Pick a patterned wallpaper or one in a refreshing color to help brighten up the cooking area.